BISHOP ELIJAH SOLOMON, D. MIN. Dr. Elijah Solomon is a dynamic and energetic ambassador of the gospel of Jesus Christ. His ability to deliver the word of God with an in-depth biblical knowledge coupled with his extensive business and personal background makes every message an inspiring learning experience. Bishop Solomon, ministering under the Holy Spirit, powerfully unlocks the keys to Kingdom living. A native of Atlanta, Georgia, Dr. Solomon is the son of the late Apostle Frank S. Solomon and the late Mother Mae Solomon. His early exposure to Jesus Christ and living by Christian principles were forged at Refuge Temple Church Of Our Lord Jesus Christ in Atlanta. Bishop Solomon is a graduate of Clark Atlanta University with a Bachelor of Science in Mathematics and he has done postgraduate study at George Washington University and The University of Maryland in mathematics and business. He received his Master of Divinity and Doctor of Ministry from Houston Graduate School of Theology (HGST) where he was elected as Student Senate President for the 2002 - 2003 school year. His doctoral project focused entitled “Develop a Model to Transition An African American Pentecostal Church into a Multicultural Ministry” is on file at HGST with the library’s reference documents. He is a retired IBM Corporation executive with thirty-two (32) years of technical and business management experience. During his professional career he amassed extensive experience in project management, business planning, marketing and software development. His customers included the National Aeronautics and Space Administration (NASA), Department of Energy (DOE), Department of Veteran Affairs (VA) and several commercial accounts in the aerospace and energy industries. Bishop Solomon acknowledged his calling into the ministry in 1973 and became an ordained Elder in 1979. During his early ministry, he served as a Sunday School teacher and superintendent, a choir director, a bible class instructor and later as financial and executive secretary to the Texas diocese of the Churches of Our Lord Jesus Christ. In December 1980, God placed him as co-pastor of his first church, Greater Refuge Temple in Houston, Texas. Following the divine calling of the Lord, Bishop Solomon established Refuge Vision Ministries (RVM) in Houston, Texas on May 30, 1982. 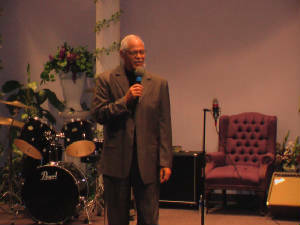 He was named pastor of Refuge Temple in Atlanta, Georgia on August 28, 2005. He is currently the active pastor of both RVM and Refuge Temple. His vision from God is for spiritual development, and prosperity, and his ministries are geared toward providing for the spiritual and natural needs of the total person. Bishop Solomon, under the auspice of his personal teaching ministry, is often requested to conduct Personal Development Seminars at churches, district and diocese conventions. His most recent seminars have been “Effective Backroom Ministry”, Financial Empowerment - God's Way”, “Building Relationships”, “7 Laws-Of 7 (Church Growth)”, and "Reaching The Un-churched". Some of his most popular audiotape messages include, “A New Beginning”, “Permission To Proceed”, “The Pursuit of Excellence”, “Live Like You’re Dying”, and “Stay Under The Blood”. He has published one inspirational booklet “I CAN!” with a central message of faith overcoming fear. He is married to Christine, who is an integral part of his ministry and vision. Together they count among their many blessings two daughters, Eleshia Monique Spence (Wally) and Keturah Davis (Ulysses), three grandsons, and four granddaughters.